CHILDRENS CELLS LIVE ON IN THEIR MOTHERS BODIES LONG AFTER - ProudMummy.com the Web's Community for Mums. 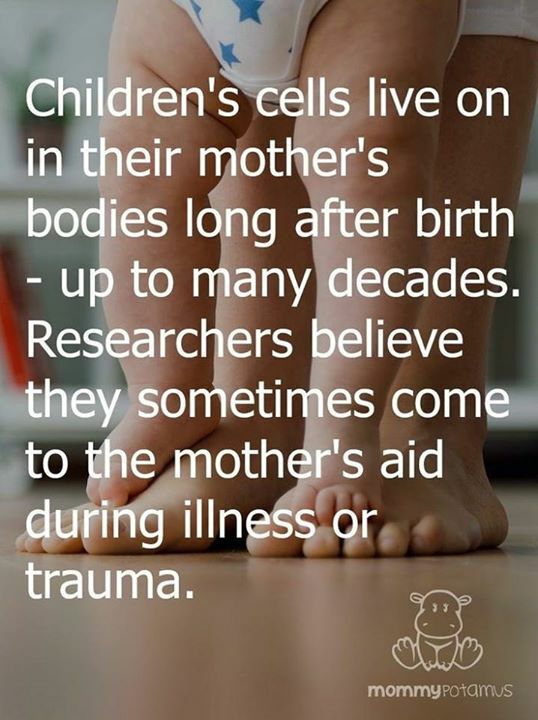 CHILDREN'S CELLS LIVE ON IN THEIR MOTHER'S BODIES LONG AFTER BIRTH - UP TO MANY DECADES. RESEARCHERS BELIEVE THEY SOMETIMES COME TO THE MOTHER'S AID DURING ILLNESS OR TRAUMA. Perhaps this is why generally women live longer than men? ?